Using the Split Excel Column	component in a flow, the data in an Excel spreadsheet&apos;s column that is separated by a delimiter can be split into several columns and then displayed in a data grid or converted into a CSV file. This component can also split the original columns into more columns, or combine them into fewer columns. Split Excel columns using a custom delimiter in the Flow Designer . In the Toolbox	panel, in the category Data > List > Excel and CSV	, drag a Split Excel Column	component to the workspace. This example creates a flow that uses the Split Excel Column	component and set mapping for the component in the Mapping Edito r.
To begin, navigate to a Designer Folder and click the Create Flow	button. Name the flow and click OK	to open it in the Flow Designer . 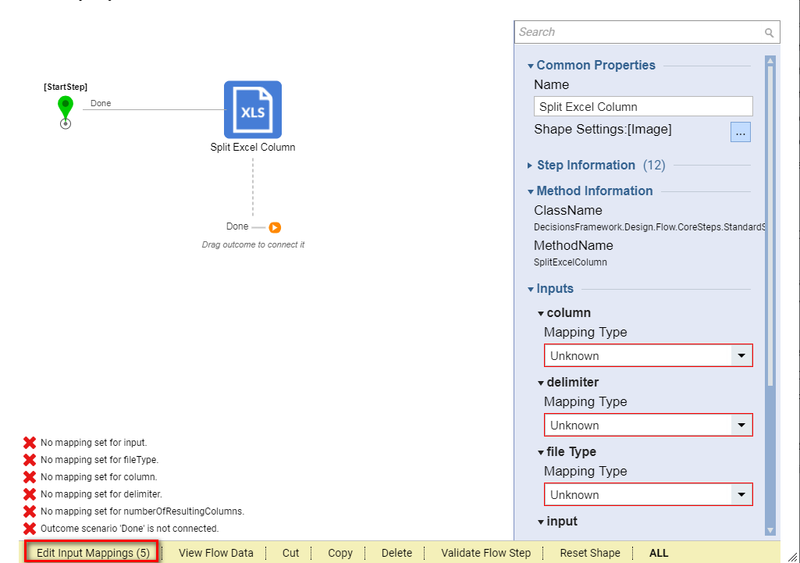 In the Flow Designer start-up window, expand the category All Steps [Catalog] >	Integration > Excel and CSV,	then select a Split Excel Column	component. Click Add	to add it to the workspace. Connect the outcome paths by connecting the Start	step to the Split Excel Column	component and then connecting this component to the End	step. To map the component, click on the Split Excel Column	step and click the Edit Input Mapping	link in the Properties	panel, or select Show Mapping Editor	from its Actions	menu. 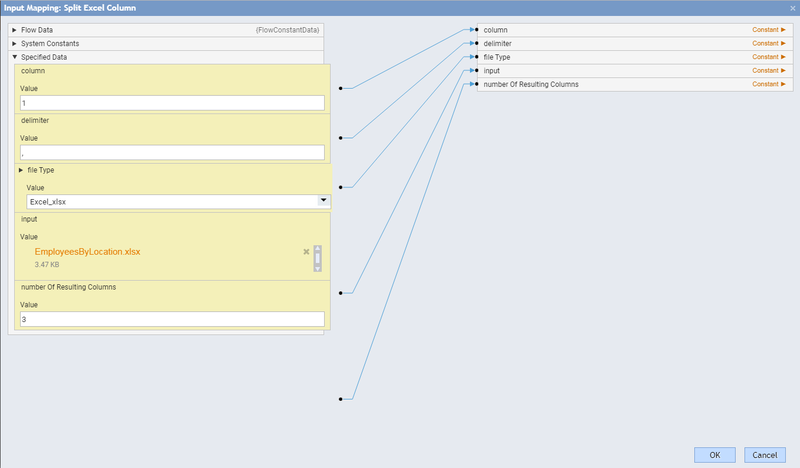 First, change the mapping type of each of the components inputs by clicking the Ignore	link and selecting Constant	. For the Input	object, enter the file name in the Value	field. For the fileType	object, from the Value	drop-down list, select Excel_xlsx	. For the column	object, specify the number of columns in the file in the Value	field. Enter the delimiter in the Value	field under the delimiter	object. Finally, specify the number of columns that should result after the columns have been split (or merged). Click OK	to save the mapping and close the Mapping Editor.